BIOS (Basic Input Output System) is software stored on a small memory chip on the motherboard. the most common uses of Flash memory is for the basic input/output system of your computer, commonly known as the BIOS. It is a program that a personal computer’s microprocessor uses to get the computer system started after you turn it on. The Basic Input Output System firmware is non-volatile, meaning that its settings are saved and recoverable even after power has been removed from the device.BIOS allows you to access and set up your computer system at the most basic level. One might think that BIOS controls input and output system. But the BIOS does much more, and it is not possible for any operating system to continue without a proper BIOS in place. Basic Input Output System has been there in our computers since the days of DOS – Disk Operating System… even before the structured DOS created by Microsoft. It turns out that the Basic Input Output System is the third type of software your computer needs to operate successfully. In years past, getting to the BIOS configuration software involved pressing a specific key on the keyboard just before the operating system started to load. The Basic Input Output System software has a number of different roles, but its most important role is to load the operating system. 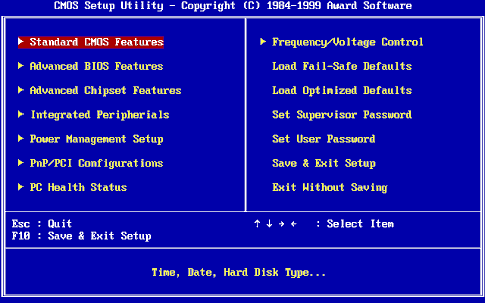 BIOS instructs the computer on how to perform a number of basic functions such as booting and keyboard control. Basic Input Output System is also used to identify and configure the hardware in a computer such as the hard drive, floppy drive, optical drive, CPU, memory, etc. The BIOS is special software that interfaces the major hardware components of your computer with the operating system. The BIOS in modern PCs initializes and tests the system hardware components, and loads a boot loader or an operating system from a mass memory device.